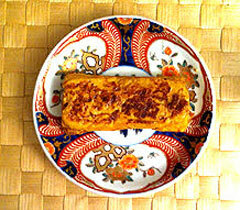 Tamagoyaki, Japanese egg omelet is a staple in every bento lunch box. Accompanied by miso soup, my husband loves tamagoyaki breakfast, noon and night. Whisk the ingredients together well. If possible, purchase a square tamagoyaki pan or use a small omelet pan. Spray with buttery cooking spray. Pour a thin layer of whisked eggs onto the hot pan. Let the egg mixture firm up a bit. Taking a spatula (ideally the same size as the pan) or chopsticks (if you are particularly agile), roll up the cooked eggs from one end of the pan to the other. Now, add another thin layer. Allow the egg mixture to set a little. Roll your first oblong shape into the second layer. Keeping adding thin layers and adding to the original roll. Tamagoyaki is similar to snowball making. So, have fun!